cf DIRECT is used for parquet installation as impact sound insulation. 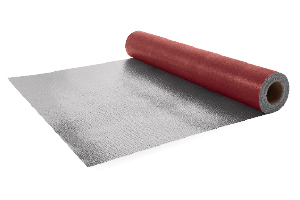 Thanks to its aluminium coating, cf DIRECT optimally transfers heat from the underfloor heating system to the floor covering. Due to its low weight, the construction is particularly suitable for renovation work. The result: optimum heat output and high living comfort - the perfect panel heating system for low installation heights.